8 Best place to buy a Bell crash helmet? 13 Alternatives to the Bell Moto-9? 14 Definitely want a Bell? 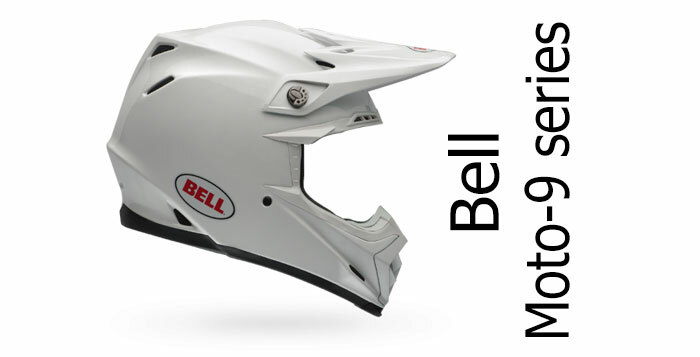 Along with the cheaper Bell MX-9, the Bell Moto-9 range of helmets has been the mainstay of Bell‘s motocross crash helmet range for some time now. But there’s a couple of different helmet technologies going on within the Bell Moto-9 range, because there’s both the ‘standard’ Moto-9 and then there’s the Moto-9 Flex. The Flex is their top-of-the-range pro-level dirt bike helmet featuring their ‘Flex’ multi-density and flexible helmet liner that’s designed to mould slightly to the wearer’s head shape as well as give improved control of shock-absorption. The first layer of the liner is also designed to move slightly under impact to absorb some of the rotational forces which can cause brain injury (for more, see the Safety section below). So there’s the Flex, but there’s also the more conventional range of standard Moto-9’s. These non-Flex Moto-9s are composite fibre helmets with a more standard polystyrene shock-absorbing liner without the rotational absorption. They’re still great helmets (read on to find out why), but it means they’re getting on for a couple of hundred less than the Flex version. First off, Bell have an excellent reputation for making helmets that give great protection. They’ve been either our top-rated or joint top-rated best brand for safety for a few years now. That’s based on how well the helmets have performed in the comparative SHARP helmet safety testing – so we’re pretty confident that most Bell helmets on the market today will give you at least a good level of protection. Having said that, the Bell Moto-9 hasn’t been tested by SHARP. It is DOT certified – and because it’s on sale all over the EU we’re assuming it’s also ECE 22-05 certified (though none of their websites actually say it is!) and it’s also been Snell tested/approved in the US. So, there’s lots of stickers and certifications that tell you the Moto-9 should be a safe helmet. 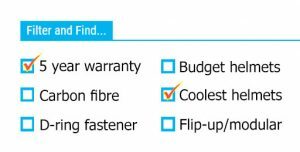 But lets have a look at the features it offers. 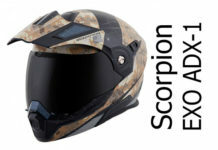 First off, when comparing the standard Moto-9 over the Moto-9 flex, they use different helmet shell materials as well as shock-absorbing technologies. 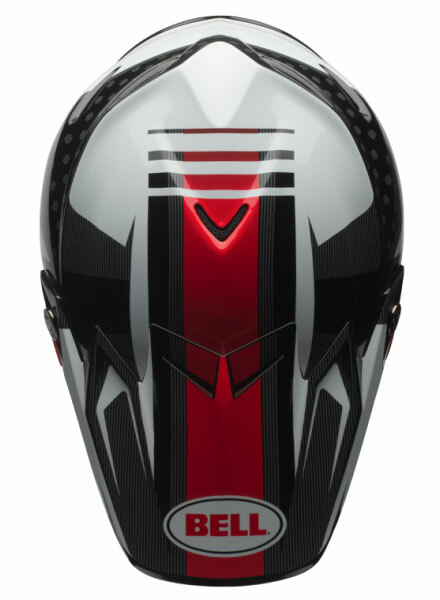 The Bell Moto-9 (non-Flex version) comes in two different helmet shell materials. The basic Moto-9 is a tri-composite shell but there’s also a carbon-composite version that incorporates a layer of carbon fibre. Carbon helmets are usually the lightest helmets, though Bell don’t make any claims that the carbon composite version is any lighter than the tri-composite. So we’re assuming here that the inclusion of carbon is probably there for cosmetic and marketing purposes – i.e. we love a bit of carbon. The standard Moto-9 also has a more conventional type of shock-absorption technology. 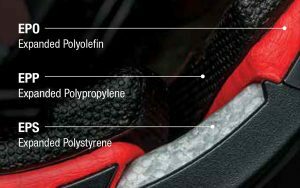 That’s the type of EPS or expanded polystyrene liner that’s used on most helmets today – and very effective it is too. This standard version has mostly been replaced in store by the Moto-9 MIPS. MIPS is similar to the Flex system below – in that the shock absorbing liner inside the helmet allows a certain amount of movement of the helmet independently of your head to reduce rotational forces during an impact. Read more about MIPS in our Bell Star review. The Flex Moto-9 is a very different beast though because Bell have put a lot of R&D into developing an alternative type of shock absorbing here. The Flex Moto-9s all have a carbon-composite shell. Carbon shells are tough and they’re typically lighter than other helmet shell materials although, again, Bell claim the same weight for both the Flex and standard helmets. Inside the helmet, Bell have used three layers of material to help absorb energy at different speeds. 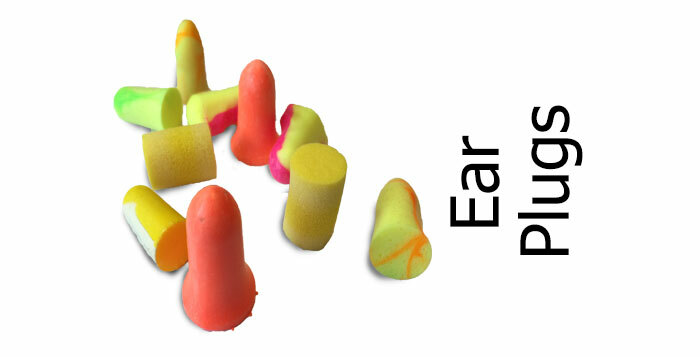 Usually, makers use different densities of polystyrene, but Bell use a layer of expanded polyolefin, another of expanded polypropylene alongside the more usual expanded polystyrene to try and target specific impact velocities. Whether it’s an improvement on polystyrene or more of a marketing angle is hard to say, but using multiple densities is a tried-and-tested formula that has worked very well over the years. The layers in the Moto-9s lining aren’t bonded together but are separate. That’s because the lining in the Flex is designed to rotate independently of the head during an impact to try and reduce the rotational forces passed to the rider. Rotation is a massive issue during an accident as it can cause neck injuries and brain injuries. Without getting too gruesome, during an impact where a helmet hits the road at speed, it starts rotating. The instant this happens, the head inside the helmet rotates, potentially causing neck damage. At the same time, the brain doesn’t rotate at the same speed as the rest of the head, causing potential damage as the irregular surface inside the skull moves against the surface of the brain. So it’s great to see Bell and a few others making real attempt to minimise impact rotation. In the case of the Moto-9 Flex, the inner lining that’s in contact with the head can rotate freely (to a point) against the second polyolefin layer. This means the helmet removes some of the rotational force from the impact. And that’s gotta be a good thing! Other than these differences between the models, there’s a range of other safety measures all Moto-9 helmets share. They’ve all got EPS behind the chin guard – that’s unusual to find on a helmet but a welcome addition that we’d like to see on more helmets. They all come with a double-d ring fastener – a bit fiddly but safe as houses if you tighten them up correctly each trip. They’ve all got EQRS or emergency quick removal system cheek guards. That means emergency services can easily pull cheek pads out of the helmet to help removal of the helmet and avoid neck injuries while doing so. Not only that, but all Moto-9’s are Eject Helmet Removal System ready. That’s an innovative little expandable plastic bag that’s fitted inside the helmet at the crown of the head linked to a rubber tube. A paramedic can then pump air into the tube, expanding the bag and thereby pushing the helmet off the head, again minimising the risk of neck injuries. A great inclusion that. If you’ve never seen it before, here’s a quick video showing how it works. Bell don’t say they’ve tried anything special to reduce noise on the Moto-9s. And other than talk of thick, plush comfort linings, there’s nothing to suggest that it’ll be any good. 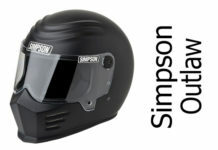 However, a couple of owners commented that it’s a really quiet helmet with one in particular saying he found it unnerving how much quieter he found it that his previous dirt helmets. Which is pretty much what we always find: we tend to judge helmet noise in relation to how noisy our previous helmets have been. So I guess that guy was probably used to wearing really noisy helmets. Also, it’s very much dependent on your riding style and type of bike you ride. Having said that, no one we came across reckoned it was noisy either (which we usually find). So either motocross guys don’t give a hoot about helmet noise – I’m guessing that’s broadly about right – or the Bell Moto-9 seems to be quiet for a motocross helmet. So we’re opting for a bit of both in our review score below. The Moto-9 has what Bell call their Velocity Flow Ventilation System. That’s essentially a load of vents in the front and a load of exhausts – and the faster you go, the more air is channeled into the lining of the helmet and out of the back. Nothing new there then. It’s what most helmets do. 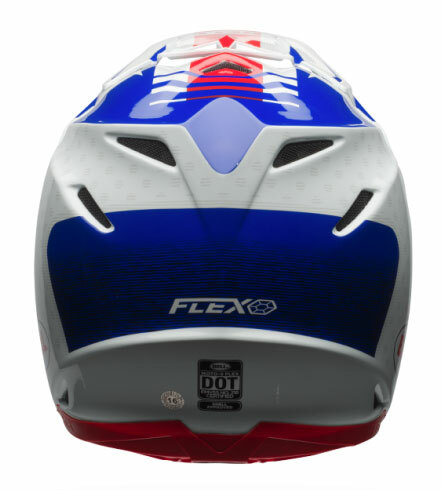 What is new is that the segmented shock absorbing lining of the Moto-9 Flex means there’s a lot more spaces to let air through onto your head. There’s 9 vents on the front of the helmet, and the chin vent features a filter that’s removable and washable. Overall, owners of all versions of the Moto-9 seem to think theirs is a great venting helmet. Obviously, like any helmet, the amount of air that’s going to get in and circulate is very dependent on how fast you ride. And of course most motocross riders are riding slower than road riders. But that said, owners agree that it gives good ventilation at track speeds and, while it’s not the best on the market, it’s well rated. The Moto-9 has Bell’s Flying Bridge Visor – that’s an adjustable visor with air intakes. It’s been designed so you can adjust it without tools and in gloves and there’s quite a lot of up/down adjustment to be had. In addition, the Moto-9 has a nice large face opening that’ll accommodate pretty well any google you throw at it. Reports are that owners with Dragon NFX, Oakley Air Brake, Pro Grip and Hustle goggles all found them to fit well inside the Moto-9. Inside all Moto-9’s, there’s a moisture-wicking and removable/washable lining. With the Moto-9 Flex, you also get their X-Static XT2 silver liner – essentially that’s an anti-bacterial silver thread woven into the liner to keep the helmet fresher for longer. The lining on all Moto-9s is particularly easy to remove. That’s largely down to the EQRS cheek pad removal system which in Bell’s case doesn’t use studs like most manufacturers, but uses super-strong magnets. That means pulling them out and replacing them is very easy and quick. That’s what Bell term their Magnetfusion system which is also used on the end of the chin strap to stop it flapping around – though a couple of owners we came across say it’s too weak for use here and doesn’t work very well. Owners agree that it’s a very comfortable helmet though. It’s designed to fit the usual intermediate oval head because that’s the shape of head most North Americans and Europeans have. And as long as that’s your head shape, you should find the shaping and the lining of the Moto-9 a good place to put your head. Note however that some owners reckon Bell’s sizing runs about half a size small – so if you’re usually a medium, Bell’s version might be about a medium/small. We suggest if you’re between helmet sizes (learn how to measure your head here) then opt for the larger size. And if you’re unsure, maybe order a couple of sizes with a view to sending one back (our recommended retailers all offer no-quibble refunds with no restocking fee). 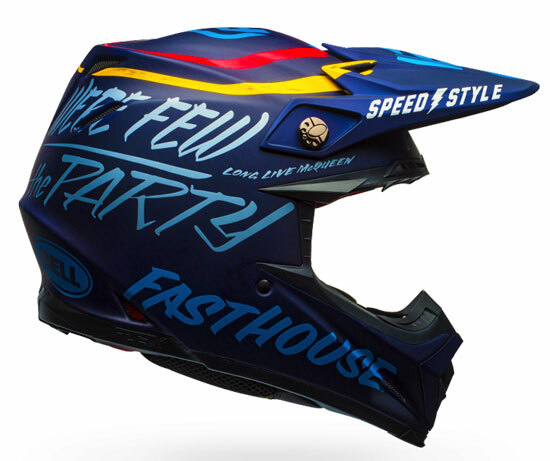 Motocross helmets are all about form over function. Even so, the Moto-9 is a bit of a looker, helped by the wide range of funky graphics available. To see the latest range of designs and their latest offers, please click the links through to our recommended retailers below. For more information on why you should buy from our recommended retailers and to see some of their key terms and conditions at-a-glance, click here. Here’s a couple of videos for ya – first a look over the Moto-9 Flex by MX Action magazine (skip to 30s to get to the meat) then a video by Bell showing a bit about the development of the standard Moto-9. 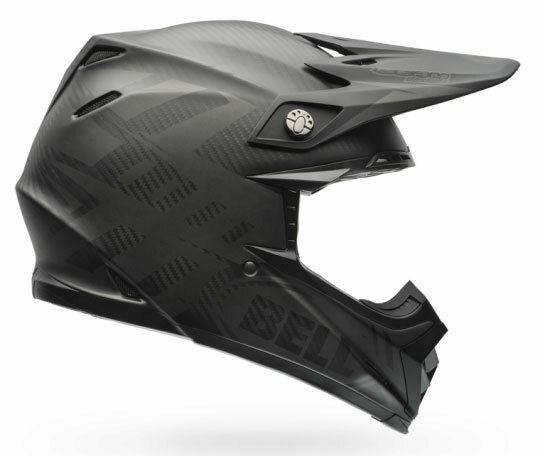 The Moto-9 is advertised as weighing in at 1.45Kg (3.2lbs) which is about average for a motocross helmet. Interestingly, Bell claim the same weight for their carbon-composite helmets as they do for their tri-composite standard helmets. Which possibly points to them swapping out a layer in the tri-composite to add in a carbon fibre layer mostly for the looks? 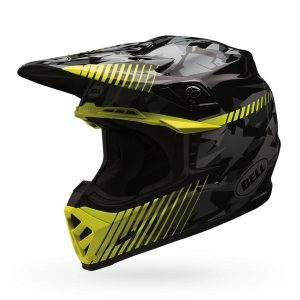 Build quality on Bell helmets has always been excellent and the Moto-9 is similarly well built with several owners commenting that the fit and overall finish is great. Finally, all Bell helmets come with a 5 year warranty. That’s a great warranty and lasts as long as most manufacturers say a helmet should last before replacement. 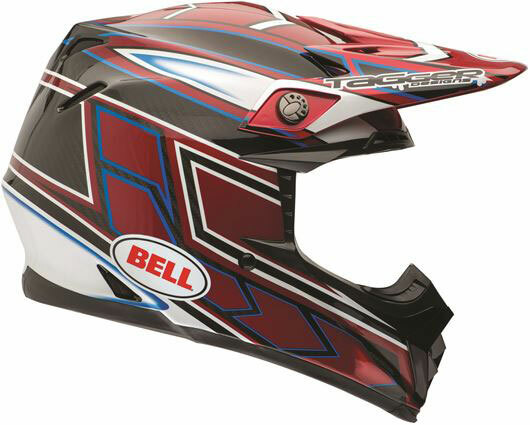 Bell Moto-9s are great motocross helmets. Developed alongside pro motocross riders, it’s well built and offers all the features you’d hope for in a modern motocross helmet. That includes good ventilation, noise suppression and comfort which are all rated highly by owners. Couple that with Bell’s reputation for making safe helmets – along with the Snell certification and the innovative Flex system on the Moto-9 Flex – and we’d expect it to offer as much safety as is possible with current helmet technology. And with the standard Moto-9 in the line-up alongside the Flex version, there’s a model to suit most pockets too. If you’re in the hunt for your next dirt bike helmet, then you really should check out the Bell Moto-9. Alternatives to the Bell Moto-9? First off, if you’re getting the feeling the Moto-9 is a bit overkill for your motocross needs (it is a pro helmet after all!) 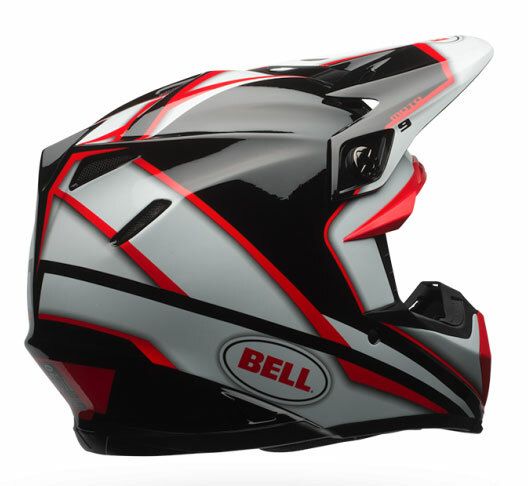 we recommend you take a look at it’s baby bro the Bell MX-9. That’s tons cheaper and a bit heavier, but still comes with Bell’s five year warranty. 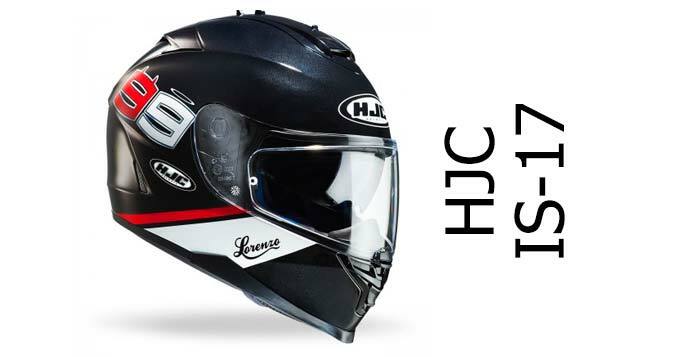 If you’re after a very light helmet, we’ve a couple of recommendations. 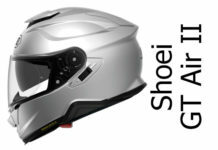 First off, there’s Shoei’s VFX-W – that’s a really light fibreglass helmet with EQRS and nice a wide goggle hole! Or if you’re not wanting to spend much money and want a REALLY light helmet, check out the super light weight Airoh Twist. Finally, we recommend you check out the AGV AX-8 – they’re lighter than the Moto-9s too with a nice wide view port and are available in the same sort of price range as the Bell. 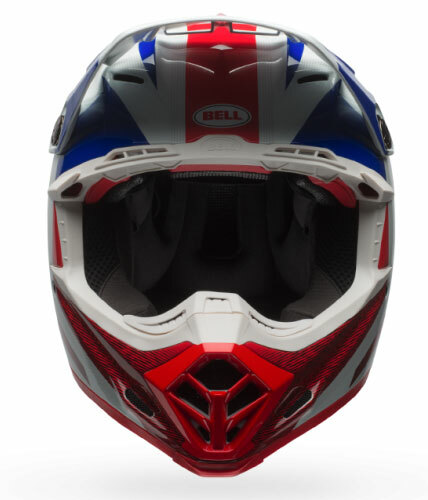 A great motocross helmet range from Bell. Whether you buy the standard Moto-9 or the Moto-9 Flex, all helmets are comfortable and well vented and come with Bell's amazing reputation for safe helmets as standard. Owners say they perform well on the track too - a testament to the involvement of pro-riders in the development of the Moto-9. 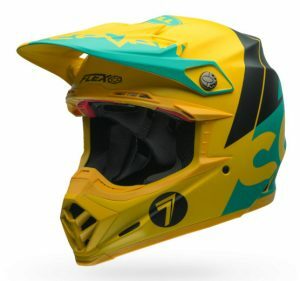 If you're looking for a new motocross crash helmet, we'd say the Moto-9 is highly recommended and a must view helmet.